Background: I have always noticed that download speeds from my server were not as fast as they 'should' have been from my Laptop (given my Internet speed and the fact that other PC's were fast), but never spent the time to find out why. That all changed when Comcast upgraded my Internet download speed to around 120Mbps. I wanted that speed from my laptop! It was time to find the root cause of the slow download speeds. 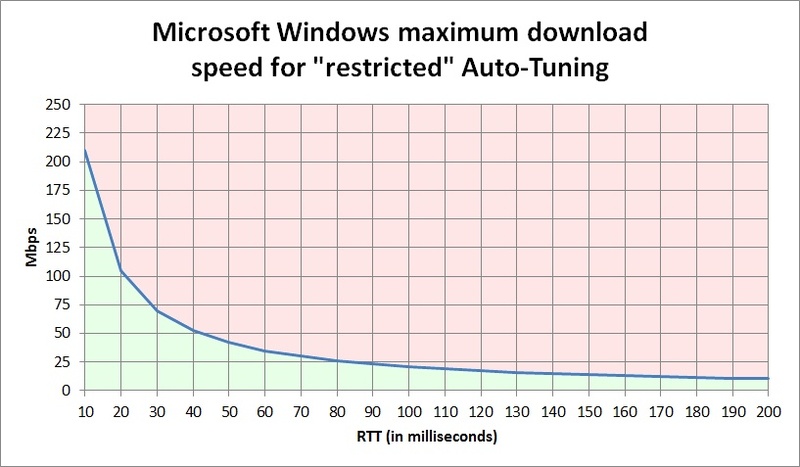 After days of sleuthing and days of research, I finally found out why, and the result was nothing short of stunning: Microsoft is intentionally restricting Internet download speeds! 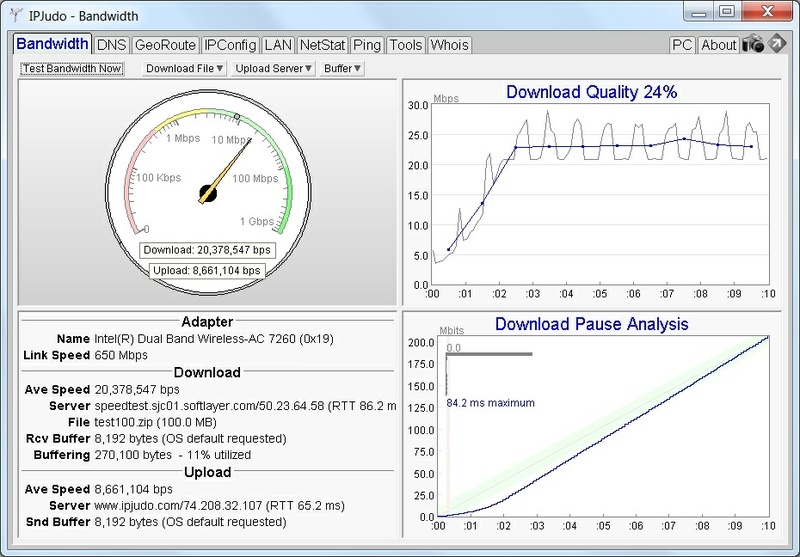 What determines/limits download speed? 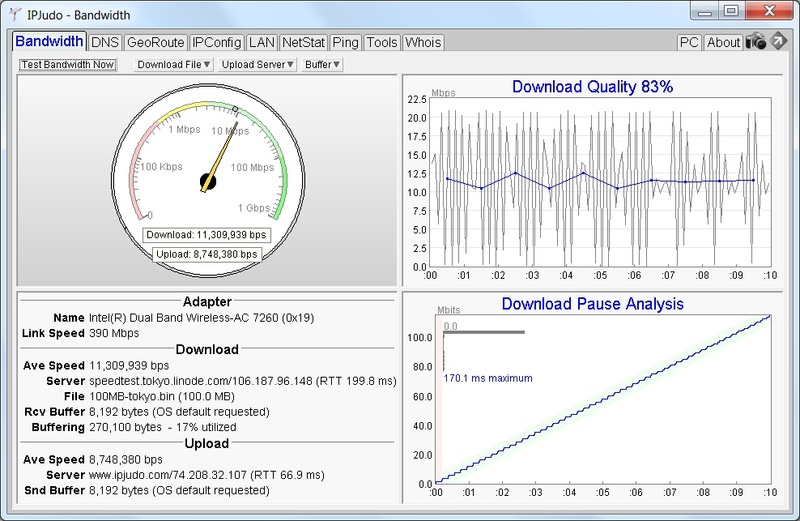 There are many factors that determine actual download speed, but if we assume that a client and server are both on fast links, the critical factor that will absolutely determine (and possibly limit) download speed is something called the 'TCP receive window' (or RWIN), which is set on a per-socket connection. Additionally, there are ways to 'scale' this receive window size (how does not matter, but it explains some terminology seen below). Windows (Vista/7/8/etc) will automatically set -- and more importantly, increase -- the size of the TCP receive window for you, as needed, to maximize throughput. Anyone notice Microsoft's spelling mistake in this output? So, Windows has "Auto-Tuning" set to "normal" (seen blue above; that is good), but the warning (in red above) is saying that the "Windows Scaling heuristics" has a role to play as well. Where profile types 'unknown/public/private/domain' refers to your classification of your internet connection. 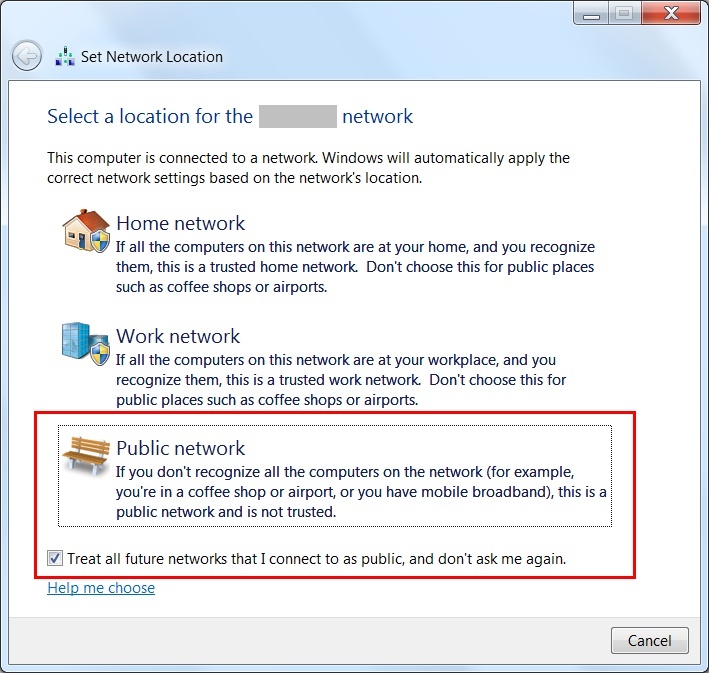 All of my connections are 'public' by default (see dialog below), which results in the Internet connection being 'locked down' for increased security -- but because of that, heuristics will then cause TCP window scaling to be "restricted"! And after seeing "but limit such growth in some scenarios", it all became very clear -- Windows itself, via its "TCP Window Scaling heuristics" was restricting my Internet download speeds! The problem: For a "public" Internet connection, Windows "TCP Window Scaling" was running in "restricted" mode due to Windows "heuristics" being enabled, and overriding the "normal" scaling mode. A quick test to see if you may be running into the problem: Open one browser window and download a large file (test file) from a known fast location. Note this result as 'speed1'. Now open two browser windows and start the same download at the same time in each browser Window. Note this combined speed result as 'speed2'. If 'speed2' is faster than 'speed1', then then your computer may have this problem. TIP: Right click on the Widnows Task Bar, select "Start Task Manager" and then select the "Networking" tab -- and you should see a graph of your raw network speed. The solution: Disable "Window Scaling heuristics" to eliminate the 'restricted' mode override -- and always let "TCP windows	scaling" operate in "normal" mode, as it should for all home broadband connections. Verification: There is no need to reboot. All of a sudden, my download speeds improved instantly, and dramatically! The change does not seem to affect sockets that have already been opened, but (on my PC) does affect any new socket connections that are made (so exit all browser windows and open a new browser to test the change). The issue only happens on fast Internet connections: In Windows "restricted" Auto-Tune mode, Windows really does not like the RWIN to go above 256KB (262144) bytes. And if you know the RTT for the server you want to download from, that defines a maximum Mbps. As long as that maximum is above your rated Internet speed, you will not even notice this problem! The average broadband user can NOT run into this problem: In mid 2014, the 'average' U.S. broadband speed was around 30Mbps (source: http://www.netindex.com). At that speed, you would have to download from a server around 70ms RTT away to even notice the problem. Most people in the US, connecting to a server in the US, will experience RTT less than that. The problem will never be seen for most people. Fast (low RTT) servers also HIDE the problem: Virtually all 'big' companies (Apple, Microsoft, etc) use cloud based servers, meaning that servers are usually only around 15ms away from you. At that RTT, to even notice this problem, you would need an Internet connection faster than 140Mbps. 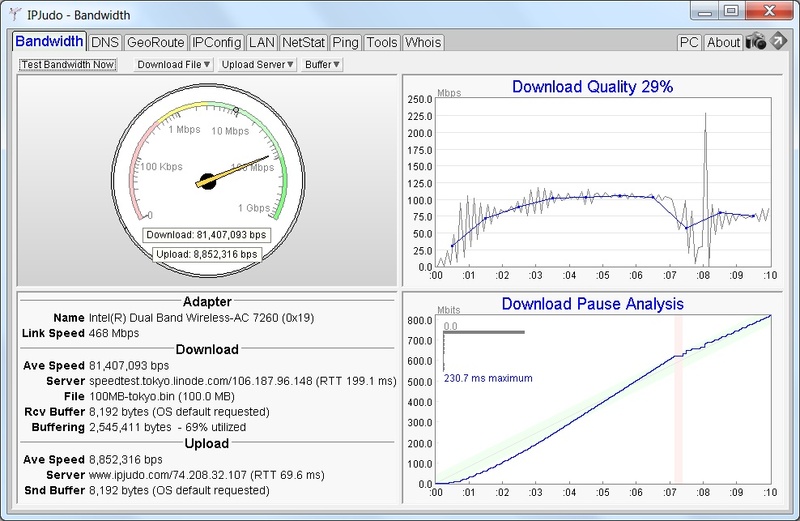 How to use this chart: Take your (rated) broadband internet connection speed, and take the RTT for a server that you are downloading from. Is that intersection above the line in the red (you will see this problem), or it that intersection below the line in the green (you will not see this problem). How to find the RTT for a server: Go into a DOS windows and "ping server-name" or "ping ip-address". Only people who speed test their connection will notice: Unless you are speed testing your connection, most people will never notice a slow down in a download. Blame the server: Even for people that notice, it is far easier to just blame the server, assuming it is running 'a little slow'. Assume that you want to download a large file from a server to your PC. One way would be for the server to send one packet to your PC, wait for acknowledgement of the packet, and then repeat this 'send/ack' until the entire large file has been sent to your PC. If the server was right next to you on a LAN, this actually might work quite well (because the server receive your 'ack' so fast). However, when the server is potentially half way around the world, the download would come to a crawl -- due to the TIME that it takes to send one packet and receive the acknowledgement. In TCP, the RTT (round trip time) is the time in seconds that takes for a signal to reach the other party and come back. It is often displayed as a whole number of milliseconds (1/1000 second). In the above scenario, there can only be one packet outstanding and unacknowledged. Clearly, the RTT from the PC to the server, determines how much data can be sent. For example, if a packet can hold 1000 bytes, and the RTT is 1 second, then, at best, you can only transmit 1000 bytes per second from the server to the PC. But if the server is in the next room and the RTT is 0.001, then we can transmit 1000 bytes every 0.001 seconds, or 1,000,000 bytes per second. And so on. How can we increase the speed of the download for a server half way around the world? By allowing multiple numbers of packets to be transmitted and unacknowledged. TCP calls the total number of bytes in the packets that can be 'in the pipe' and unacknowledged the RWIN (receive window). So the formula for determining the maximum throughput is very simple and is just RWIN/RTT. And now it becomes obvious why the size of RWIN is so critical to throughput. The size of RWIN puts an upper limit on throughput. TIP: There is a Wikipedia article on this subject as well. 7. Is the best form of flattery ... stealing? "I just wanted you to know that there's a website out there that stole the content of your post, "How Windows is killing Internet download speeds" word for word, claiming it as their own, and even using your images by directly linking them on their blog." So I investigated and sure enough, some yahoo copied virtually this entire article, and when contacted, the infringer stated "I think it's a miscommunication of intent, as it was intended to share, not steal". Absolutely hilarious -- because 'sharing' this article, means copying this article, which is copyright infringement. What is a copyright? See this Wiki article on the subject. In short, 'copyright' gives the creator of an original work (an article/words, photographs, artwork, computer programs, etc) the exclusive legal rights to control the reproduction ('right to copy', hence 'copyright') of said original work. Copyright covers the 'expression of an idea', not the 'idea' itself. I have then seen people mistakenly conclude that writing an article about some known idea can then not be copyrighted because the idea is known. That is outright flawed logic. The 'expression of the idea' (the words) is -- by definition -- what is copyrightable. For example, write an article on how to best play game XYZ. Many other people have also previously written articles on how to best play game XYZ. But as long as your article is your words (original and not the words that you copied from someone else), your article is copyrightable. What is copyright infringement? See this Wiki article on the subject. In very simple terms, using/publishing/etc someone else's original work without their permission. A very simple copyright test: Take any article you are about to publish and take several arbitrary sentences from your article. Now use Google and search for these quoted sentences (placing the sentence in quotation marks is a key step). If you find any hits, your article is NOT original (and will raise copyright concerns). At the very least, you will be called out for plagiarism. Best test of all: Run any articles you are about to publish through any one of the many online plagiarism checkers. The bottom line: Be original. Never cut/paste from others. And you will never get in trouble.